The officers and members of the Winchester and Portsmouth Diocesan Guild of Church Bell Ringers have, for several years past been delving into their history and planning ways of celebrating and marking the centenary year of the Guild. One of the high spots of the celebrations was the dinner held on Saturday, April 28th at the Royal Hotel, Southampton when a capacity gathering filled the dining room to partake of a first class meal and to hear congratulatory speeches from a number of eminent individuals. In one of the several reception rooms of the hotel an interesting exhibition was staged with plans of the various reorganisations of the districts over the years; special peal records and peal books; model bells; and a table set up for the sale of centenary mugs and goblets. On the dining tables, which were tastefully decorated, stood the several silver challenge cups and shields which are competed for yearly among the districts and towers of the Guild. Apart from the happy atmosphere and bonhomie pervading, one vital factor made the evening exceptional: the dinner started on time; the interval often minutes was exactly that, and the speeches were extremely good and to the point; interesting; and at times most amusing. It all finished by 10 p.m., which left two hours (before the bar closed) for all to join in a convivial round in the hotel's fine lounges. The W. & P. must be the only guild which has two presidents: the Bishops of Winchester (Rt. Rev. John Taylor) and Portsmouth (Rt. Rev. Ronald Gordon). On this occasion the latter Bishop presided, the former being one of the distinguished speakers. Following the loyal toast, the chairman welcomed the gathering, congratulated the Guild on its centenary and expressed his personal thanks to all for their hospitality, and for their service to the Church. After the interval the President of the Central Council (Mr. Edwin A. Barnett) proposed the Winchester and Portsmouth D.G., saying it was a great pleasure for his wife and himself to be present at the centenary dinner. "I think the first thing we should do is honour your Guild's founders," continued Mr. Barnett. "J. A. Trollope, the celebrated ringing historian, wrote that the general status of ringers reached rock bottom about the decade following the year 1860. Ringers had gained and to some extent earned a very bad reputation, so much so that some clergy would not have their bells rung on Sundays; just chimed instead. But there was a small group of men, some clergy and some laymen, who devoted themselves to the work of reform. They recognised that the most important thing was to bridge the gap between churchpeople and ringers, and that led to the formation of the county and diocesan societies that we all have today. The Bishop of Portsmouth (Rt. Rev. Ronald Gordon), who presided, chatting with Ken Croft (Master, W. & P. D.G.). Mrs. Olive Barnett (wife of the C.C. President) makes an attractive addition to the photograph. "In the Diocese of Winchester those concerned were the Revd. 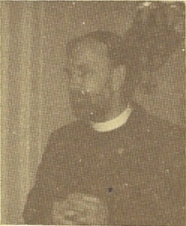 Arthur du Boulay Hill, at the time an assistant master at Winchester College, who became your first secretary; and the Revd. Canon Francis Thomas Madge, librarian of Winchester Cathedral, an appointment he held for more than 50 years. In fact it is pleasant to record that both these gentlemen survived well beyond your golden jubilee. Canon Madge, I believe, was not a ringer but Mr. Hill was a founder member of the Oxford University Society, an organisation not unknown to the distaff side of your family, Mr. Master. The reply to the toast of "The Visitors" was made by Michael Church, Master, Guildford D.G., seen here with his wife, Lucy (left) and Mrs. Madeline Croft, who enjoyed Michael's comments. 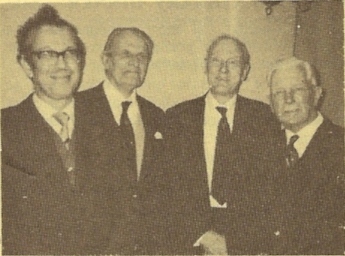 "It would be impossible to speak of the many who helped to build on the foundations these gentlemen laid, but a few names must be mentioned, like that of George Williams, at different times secretary and master of the Guild, and one of the still very few who not only rang, but also conducted more than 1000 peals. (In parenthesis, Mr. Master, I see from this week's 'Ringing World' that someone we both know well, Jack Millhouse of Lincoln, has just joined that select list). Mr. Williams' wife was the first lady to ring a handbell peal, but more remarkable perhaps is that Alice White of Basingstoke was not only the first lady to ring a peal of any kind, in 1896, but that she still survives in Canada at the age of about 98. Not many of us are likely to be around 83 years after our first peal. Someone else who learned to ring at Basingstoke a few years earlier was Frank Bennett, another early 1000-pealer, who was incidentally my wife's grandfather. "In more recent times someone who has done a tremendous amount for ringing generally is our friend Canon Felstead, whom I've had the pleasure of knowing for more than 30 years since the days when he was convenor of the Central Council's Methods Committee and I one of its unruly members. I cannot conclude this very random list without mentioning the astonishing feats that you, Mr. Master, and your family have performed on handbells in recent times, for which I'm sure all of us present have the greatest admiration. (Applause). 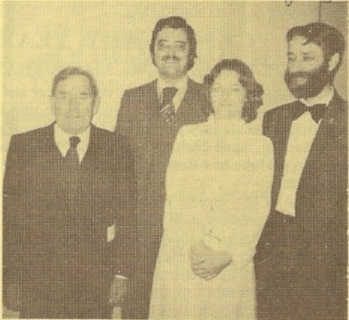 Derek Jackson (l.), for a number of years Guild hon. sec., did much of the organisation of the dinner. Next to him is Arthur V. Davis, now in his 80th year, who designed the menu card and hand-coloured each one, and on the right is Frederick E. (Ted) Collins (78) who was elected to Guild membership in April 1919. The C.C. president (Teddy Barnett) joined this select company for our photographer. "So much for the past. What of the present and the future? At your 1972 dinner, one Derek Jackson, your secretary, said, 'Over the next 7 years I challenge you to take positive steps to ensure that, in our centenary year, every ring-able tower has a band who can celebrate the event by ringing at least rounds or call changes.' It would be something of a miracle if this has come to pass, but I think it's true to say your Guild has a better record than many in this respect. I am only too well aware of the difficulties in keeping together a Sunday service band. Some years ago I read of a man who had celebrated 60 years as a ringer. Asked why he'd become one he said, 'Well, there wasn't much else to do in our village.' Not the ideal motivation perhaps, but it served his church, and ringing, in good stead. There is no doubt that present day mobility is a major difficulty, however useful it is in enabling people to progress in ringing by meeting up here, there and everywhere. Similarly I can't help feeling that uniting benefices, however necessary this may be, is another drawback when services are held in one church one week and miles away the next. I'm sure this affects not only ringing but all other parish organisations. "I don't pretend to know the answers, but can only say that it is up to all of us to do our best to ensure that the art of ringing will survive, and it is the influence of guilds such as yours that will help it to do so". Asking the company to rise and drink the toast of "The Winchester and Portsmouth Diocesan Guild", Mr. Barnett coupled with it the names of "Arthur du Boulay Hill" and "Francis Thomas Madge". The Bishop of Winchester who first replied to the toast, thanked the Guild for allowing him to attend their celebratory dinner, and for the honour of being its patron. Speaking of multiple parishes, he said it was here that the ringers came into their own, for if he and his chauffeur were endeavouring to find an isolated village church, when the bells were heard he told the driver to "make for those bells" (laughter). When in Shropshire some years ago, he (the speaker) had commented during his sermon on the cheerful welcome the bells had made before the service. He then (foolishly) added: "If there happens to be a ringer in church now perhaps he would tell the ringers how much the bells were appreciated". At the end of the service eight ringers lined up and informed him the whole team was present for all the service (renewed laughter and applause). "Winchester", said the Bishop, "is a city of bells and birds - both equally lovely". He then quoted the Latin inscriptions from two of the Cathedral bells, giving their translation and suggested that such inscriptions, if collected and printed, would make interesting reading. The bells, with their iron tongues, sounded out over our land with many voices: in danger, in victory; in joy and sorrow. "Thank you for all you do and my good wishes as you set out for your next 100 years", concluded the Bishop. "In the Andover and Alton and Petersfield Districts advances in method ringing involving young and old alike, with significant numbers of new members being elected; in the Basingstoke District the initiative that set this year off to such a fine start by producing the first centenary cake; in the Christchurch and Southampton District a superb DIY effort at Eling and growing activity in the Channel Isles attached to this district; in the Isle of Wight District where nothing is too much trouble in catering for ringers visiting the Island and whose Carisbrooke band took the Alec Grey Cup from the mainland for the first time; in the Portsmouth District where some first rate social occasions are organised and vigorous fund raising takes place; in the Winchester District where a resident handbell band is developing and where for this centenary a record is being produced of the ringing at 10 towers, to be called 'Centenary Bells'. "This is just a selection from the great activity that is making the W. & P. so alive today. Each District, from the mainland and over the waters from the Isle of Wight and the Channel Isles, is represented here tonight. So are the Southampton University Society, and also the Cathedrals and Winchester College, thus providing a link with our Founders, Arthur du Boulay Hill and Francis Thomas Madge, whom we shall be remembering particularly at our Centenary Service of Thanksgiving in Winchester Cathedral in June. "The Centenary has revealed that we have in our Guild a variety of talent which has been offered freely to the Officers and to the Centenary Committee. "James I, you know, said, 'No bishops, no king'. Ringers could well reflect, 'No people, no church, no ringing'. So perhaps of greatest significance for the future is the fact that our Guild is undergirded by many of our ringers who take a part, extending well beyond their ringing, in the life of their churches. "These hopeful signs enable us to look forward with confidence". Mr. Edwin A. Barnett (President, C.C. ), Mrs. Taylor and the Bishop of Winchester (Rt. Rev. John Taylor) who replied to the toast of "The Guild". The Rev. Peter Robbins, chairman, Basingstoke District, proposed "The Visitors", first by greeting the two Bishops. He said perhaps the Guild was setting an example by having two presidents, for the Election on the following Thursday was to decide who should lead our country. Teddy and Olive Barnett received a warm welcome as did Michael Church (Master, Guildford D.G.) who "had to come to the W. & P. to find a bride" - Lucy Freemantle of Hursley whom he had married a few weeks earlier (applause). The love-hate relationship which many experienced when reading the "Ringing World" was addressed to the editor of that journal. "When we read things which speak well of ourselves or our Guild we love the R.W., but when there are printed items of which we do not approve it has the reverse effect," continued the speaker, amidst laughter. Mrs. Edna Denyer was welcomed as were visitors from Derbyshire (Michael and Margaret Thomas and family); from Bristol (Chris and Heather Kippin); from Dorset (Tim Collins and his fiancee Janet Rose); from the U.S.A. (Donald Trumpler) and finally from London (Eddie Futcher). "There is a 'love-hate' relationship between readers and The Ringing World", declared the Rev. Peter Robbins, who proposed the toast to "The Visitors". Replying to the toast, Michael Church thanked the previous speaker for his kindly comments and then extended good wishes and congratulations to the Master, officers and members of the W. & P. on their centenary. "We in the Guildford D.G. have just celebrated 50 years of our 'release' from the Winchester D.G." he added, a comment which caused much amusement. He then spoke of the relationship and friendship which existed between the Guilds and complimented the organisers of the evening on the splendid arrangements made. "Thank you, Master and W. & P. members for entertaining us in such splendid style this evening and good luck and very best wishes for the remainder of your centenary celebrations and also for the future" concluded Mr. Church. The Master thanked the manager and hotel staff for the excellent service rendered and expressed appreciation to Derek Jackson for his hard work in the organisation of the evening. The Bishop of Portsmouth then declared the formalities closed and there followed two hours of happy socialising and handbell ringing. Among the exhibits at the Dinner on April 28th were drawings showing the Winchester Diocese in 1800; one of the formation of the Guild in 1880; Scheme for reorganisation in 1903; the Guild area in 1913; the formation of the Winchester and Portsmouth D.G. in 1928; and the reorganisation of the Districts in 1934 and again in 1968. The Guild's three massive peal books were on view; several beautifully embroidered peals (framed); and one of early Hampshire peals by local bands. The table plan, prepared and illuminated by Arthur Davis, was much admired and will be placed in the Guild Library as a record of those attending. 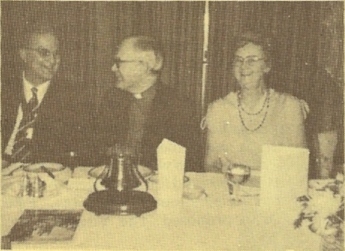 Seated at the top table were the Bishop of Portsmouth (Rt. Rev. 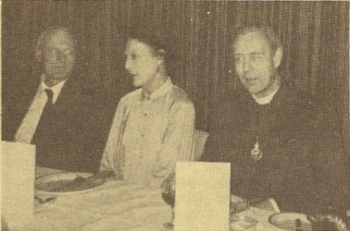 Ronald Gordon), Mr. K. S. B. Croft (Guild Master), Mrs. Croft, The Bishop of Winchester (Rt. Rev. J. Taylor), Mrs. Taylor, Mr. M. J. Church (Master, Guildford D.G. 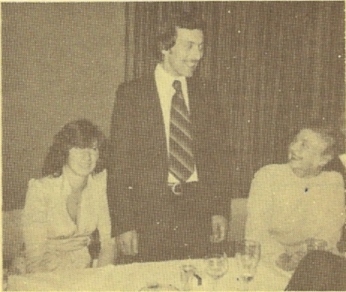 ), Mrs. Church, Mr. E. A. Barnett (President C.C. ), Mrs. Barnett, Rev. P. Robbins, Mrs. Robbins, Mr. B. J. Fry (general secretary), Miss P. A. Champion, Mr. A. V. Davis, Mrs. Davis, the R.W. Editor and Mrs. C. W. Denyer. At the dinner every District was represented, and included members from the Channel Islands and from the Isle of Wight. Amongst the senior members present was Mr. F. E. (Ted) Collins who was elected to the Guild in April 1919. Mr. Lester Bailey, the popular member from the Isle of Wight, completes 25 years as Guild Hon. Auditor during Centenary Year. A link with one of the founders was provided by a member representing Winchester College and members from the Southampton University Guild were welcomed. Between the speeches Bristol S. Major was rung on handbells by Gail Cater, Alison Surry, John Colliss and Roy LeMarechal. "Meet the mayoress!" This comment introduced Mrs. Blanche Hunt of East Meon who, on a velvet collaret round her neck, had mounted 20 or more badges of different guilds and associations. It certainly gave a distinctive and regal air to the lady's attire. "A family gathering draws friends from outside and this is one of the virtues of bellringers. There is always room to welcome others and it is good to have ringers and former ringers to join in any of our celebrations": The Rev. Peter Robbins, who proposed "The Visitors".